Canada and Europe are set to sign their long-delayed free trade deal later today at a summit in Brussels. 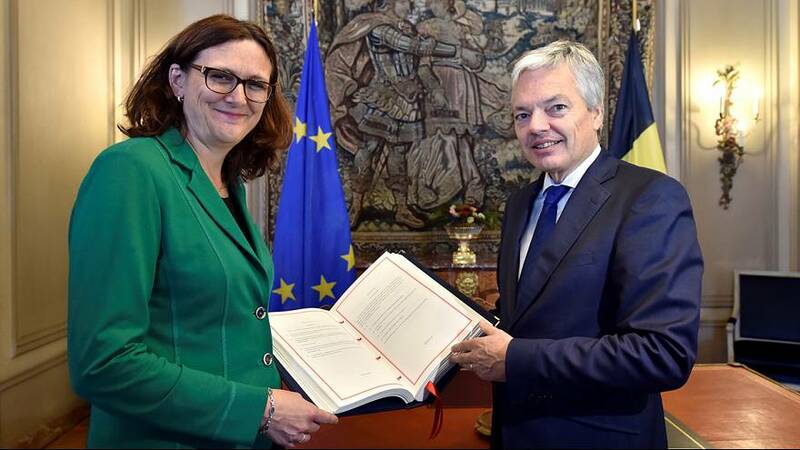 Earlier Belgian Foreign Minister Didier Reynders signed the accord on behalf of his country along side EU trade chief Cecilia Malmstrom and Canada’s ambassador to Belgium. Canadian Prime Minister Justin Trudeau is due to attend the summit and signing ceremony. That was announced after a series of key votes in Belgian regional assemblies on Friday ended opposition, which had threatened to destroy the entire deal. The agreement, known as CETA, requires all of the EU’s member states to endorse it. Backers say it will boost bilateral trade between Europe and Canada by a fifth by removing tariffs on almost 99 percent of goods. But those against trade pact, and a similar deal proposed by the EU and US, known as TTIP, fear the two treaties’ will strengthen multinationals, and worsen food, environmental and labour standards.